Nikko VaporizR Is Amphibious RC Toy | OhGizmo! With a hip, trendy name like that, the Nikko VaporizR is sure to sell like hotcakes. Just as it’s too cool for the letter “e”, it’s also too awesome to let itself be confined to just one terrain. 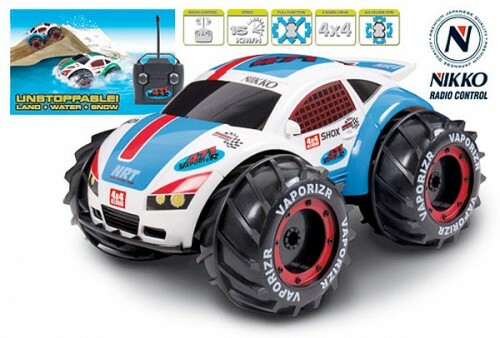 The oversized wheels on this remote control car act like paddles when floating in a body of water, and provide some additional grip when treading snowy ground. Powered by two electric motors, it’s a true 4 by 4 and is even able to do 360 degree spins. Reaching a top speed of 9mph on ground, it grinds to an alarming crawl in water. But so what? At least it doesn’t sink and short circuit like pretty much any other RC toy out there. It’s £40 or about $63. How awesome! I totally want to check this out and play with it!